This marketing book examines many different ways that the Boomer generation is redefining consumerism and community engagement, fulfilling its longstanding status as Generation Reinvention. You can transfer learning about this generation to your insights about younger generations that will eventually progress through similar life stages. So, in this sense, the book is not merely Boomer-centric. 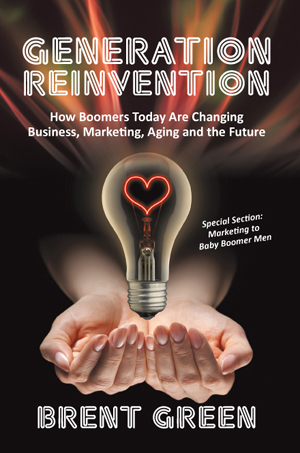 The first section takes a critical look at myriad opportunities unfolding around the Boomer generation, both for branded consumer products and services and most assuredly for those industries that have traditionally targeted mature markets. You’ll discover how marketers have become more involved and evolved in their conceptualizations around a generation, and how these insights are transforming industries in the future. The second section addresses what it means to be part of a generation and the practical implications for marketers. The terms “Baby Boomers” and “Generation” get tossed around rather freely in business, media, and political circles, but I’ve noticed some fundamental inadequacies in understanding of generational sociology and psychology. It’s time to add clarity to what it means to be part of a generation. I also review several different research studies that can help us better understand what Boomers are thinking today so we can more precisely predict where they’re heading tomorrow. The third section surveys marketing campaigns across a number of industries. These case studies will augment your understanding of generational theory and research with practical applications in the marketplace. You’ll gain more nuanced insights into how different industries are reaching out to Boomers today, a presage of how they’ll continue to develop this market in the future. We also explore a few campaigns that I believe fall short of their goals. The fourth section looks around and beyond marketing into sociology, psychology, social policies, and many of the ensuing debates about Boomers and aging. What is my point? I believe we cannot separate how we understand a market segment—in this case a generation—from broader debates about a generation’s historical value; how the generation is perceived as part of mainstream culture; how critics and supporters enliven the dialogue about a generation’s extrinsic value; and how many political and social debates about population aging intersect with the business of selling Boomer consumers products and services. A generation busy with reinventing itself has implications for all comers: politicians, governmental entities, traditional and online media, community planners, business analysts, equity investors, nonprofit organizations, and, of course, brand marketers. The final section addresses an underdeveloped market niche: Baby Boomer men. Since Boomer men represent slightly less than half of the generation, they are also a market force that’s calling for more focused attention. By bringing together gender and generational insights, I intend to provide businesses, nonprofits, and social policy planners with more sophisticated understanding of a generation of men who, along with their female peers, are dramatically changing social and commercial discourse. Generation Reinvention is about Boomer reinvention and business reinvention. Marketers have the opportunity to help characterize the changing cultural narratives about aging, making the later life stages as central to defining the American experience as youthfulness. Since “mature” is the minority group to which anyone who survives long enough will eventually belong, isn’t it about time we embrace the aging process more fully? 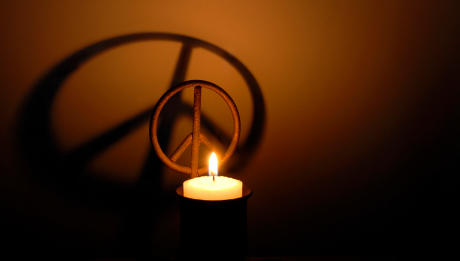 Isn’t it time to create a vital new marketing paradigm around mature Boomers? Boomers and astute marketers are showing us how when we pay close attention. The economy will benefit. Companies will benefit. Nonprofits will benefit. Society will benefit. Now available from most online booksellers, including Amazon! Click here to get your copy of GENERATION REINVENTION.